All transactions are safe and secure with a reliable history in online purchasing behind each of our associates. 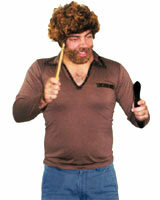 Buy the Gene Frenkle More Cowbell Costume to own More Cowbell clothing and merchandise. Let everyone know that the only prescription for your fever is this Gene Frenkle More Cowbell costume. The outfit ships with the brown retro long sleeve top, a drumstick and a cow bell. The long sleeve top is made of 100% soft cotton and features leather trim that adds to the outfit's 70s appeal. You'll just need to grow a beard and locate the rest of the band members. Your manager Bruce Dickinson might know where they're at. In addition to the Gene Frenkle More Cowbell Costume above, browse the More Cowbell Clothing Gallery for more apparel like men's and women's clothes, kids shirts or hoodies.